Red Gold is one of those brands that I can always spot on the shelf even when I’m not looking for it. I’ve always through that the bright yellow label with the bright red tomatoes was genius marketing. It’s basic, but very noticeable and plants itself in your memory. It’s a Midwest brand that we are all familiar with! Combine beef & tomatoes (drained). Form into patties. Season. Add cheese to center of each patty for an added kick. Grill. As desired, serve on toasted bun. use Jalapeño Ketchup or Chipotle Mayo. Layer spicy peppers. In addition, Red Gold is hosting a Red Gold Summer Grillin’ Party on their Facebook page! There is a weekly drawing for 1,000 aprons in addition to a grand prize of a Big Green Egg Grill and Red Gold Grilling kit! Be sure to enter between now and 7/23! 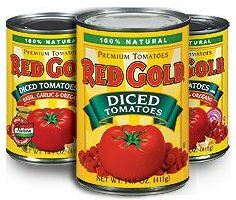 To get everyone excited about a little tomato kick for their grill, I am giving one lucky winner a Red Gold Tomatoes Prize Pack! To enter this giveaway, complete any or all of the options listed below. Giveaway ends 7/8. Good luck! It’s a tie between homemade tomato soup and chicken cacciatore. We use canned tomatoes in our homemade chili! I like it in my spaghetti! My Mom’s beef stew recipe. I never grow tired of it! Chili is my favorite meal to make that includes canned tomatoes. My favorite is a Summer Squash Pasta recipe that I found in a magazine years ago. Thank you for the wonderful giveaway. I make a simple dish of pasta and canned tomatoes for my Mom. It’s her favorite. I like making catfish over diced tomatoes and rice. I like making queso with canned tomatoes. We like making homemade chili with them. I love chili and homemade pasta sauce. I like to make pasta sauce. My favorite dish to make with canned tomatoes is chili. I always add canned tomatoes to my soup – thank you. I love using canned tomatoes to make salsa and nacho dipping. I like to use canned tomatoes when I make eggplant parm. I like to make spaghetti with their tomatoes. I love using canned tomatoes to make homemade chili. I use them for chicken cacciatore. My homemade Chili is my favorite recipe to use Red Gold Tomatoes. I put canned tomatoes in my homemade pasta sauce with meatballs. I use canned tomatoes in my turkey chili! I make a stacked enchilada casserole, and the sauce is based on canned tomatos and green chiles. I like making succotash with stewed tomatoes added to it. I make pasta sauce almost every Sunday. This would come in handy. Chili! I make it all year long. We love it. Thanks. My favorite meal to make that includes canned tomatoes is my goulash recipe. I love making veggie soup! Chili, and I just made some last night! I like making lasagna from homemade marinara sauce. There is a slow-cooker recipe for enchiladas that uses canned tomatoes. It’s one of our favorites!!! We love to slow-cook & create homemade chili! I use them when I make soup in the winter. I like to use canned tomatoes to make my homemade spicy chili. We make pasta and meat sauce. i really like to make goolash! I like to make homemade chili with canned tomatoes. I like to put canned tomatoes in my beef soups and stews. My Fra Diavolo Sauce, it’s Great with shrimp, scallops and mussels. fresh garden zucchini, yellow squash, tomatoes, onions and peppers all sautéed together. My favorite meal to use canned tomatoes is a tie between spaghetti and chili. I like to make chili with canned tomatoes. I use them when I make chili or soup. I like to make spaghetti sauce with them. I like to make Pasta with Italian sausage, fresh basil and tomatoes. I like to make beef stew with canned tomatoes. i like to make american chop suey with them. I like to make meatball subs. I put Pepper Jack cheese on top of the meatballs and cover it all with diced tomatoes with green chilis. I put all of this on french bread. My whole family loves this! Mine is a nice homemade vegetarian chili! i love using them to make spaghetti and meatballs! Turkey Chili in the slow cooker would be my favorite. Chili ! I love making chili!! I used to make sauce almost every Sunday, have cut down a bit! Thanks for the giveaway… a big pot of homemade chili ! I use it for so many recipes, salsas, chiles, pizza sauce, pasta sauce, etc..
My favorite dish to make with canned tomatoes is Spaghetti Sauce.